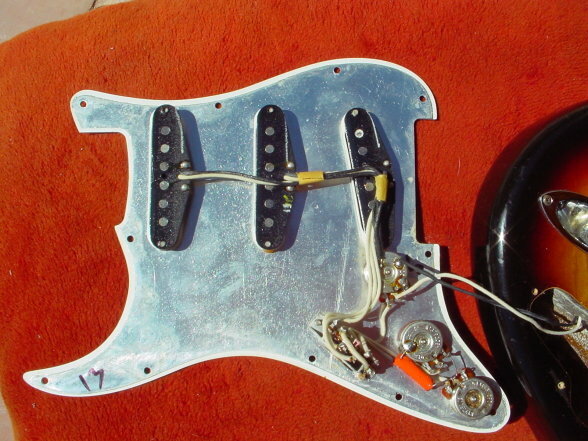 CBS bought Fender in January 1965 and sold it in March 1985. There is much debate about the quality of guitars produced during those years and quality control was poor at times but some very good guitars were made during that era as well. 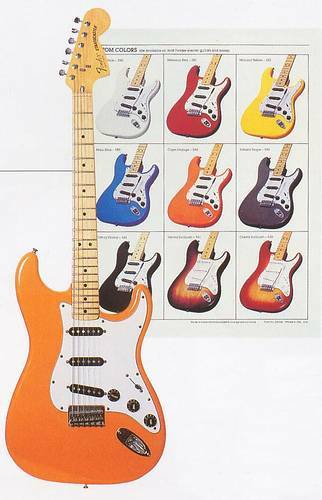 It was the era which started Fender Japan and gave us the first vintage reissues so we must give them credit for that. The names I have used are not necessarily official or generally recognised names it's just to differentiate in these pages. 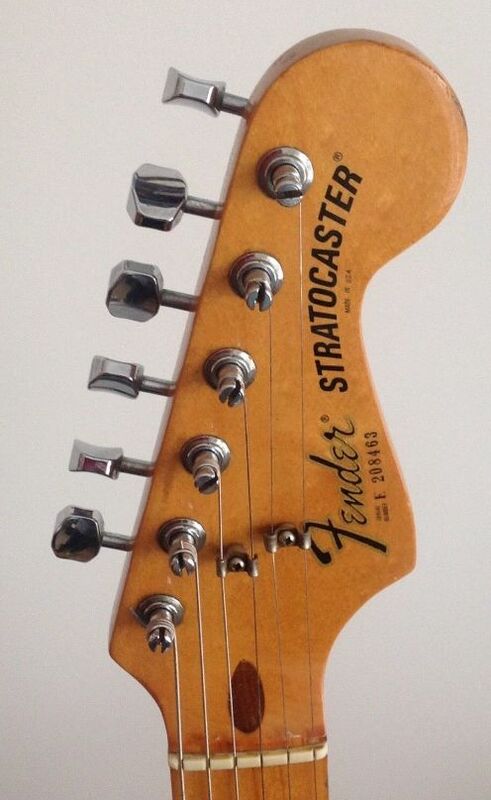 Headstock Enlarged 1 string tree truss rod adjust at body end Transition Logo until around 1967 when Thick black CBS logo with Stratocaster written in bold capitals always Nitrocellulose finished. 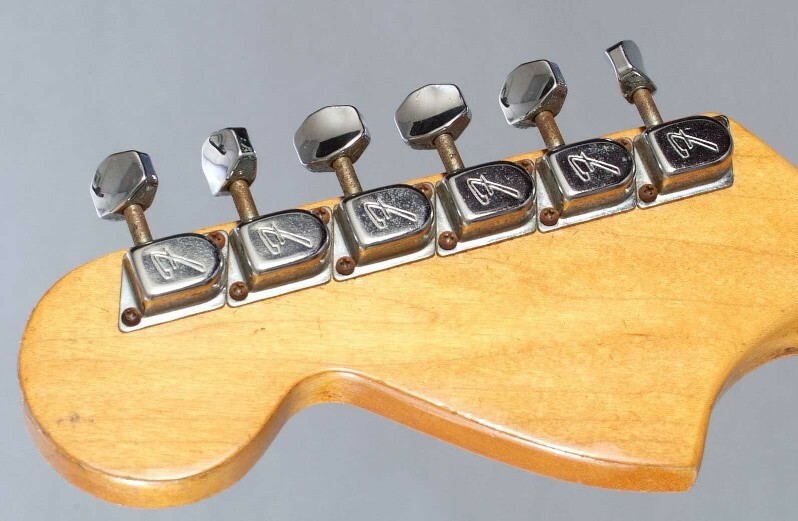 Nut Varies according to the code on the neck A=1.5" B the most common = 1.625" C =1.75" D = 1.875"
This is the standard stratocaster from 1971 to 1981. Tuners Fender Schaller Chrome plated F stamped said to change from open type to close type in 1975 not sure I can see the difference can anyone help? 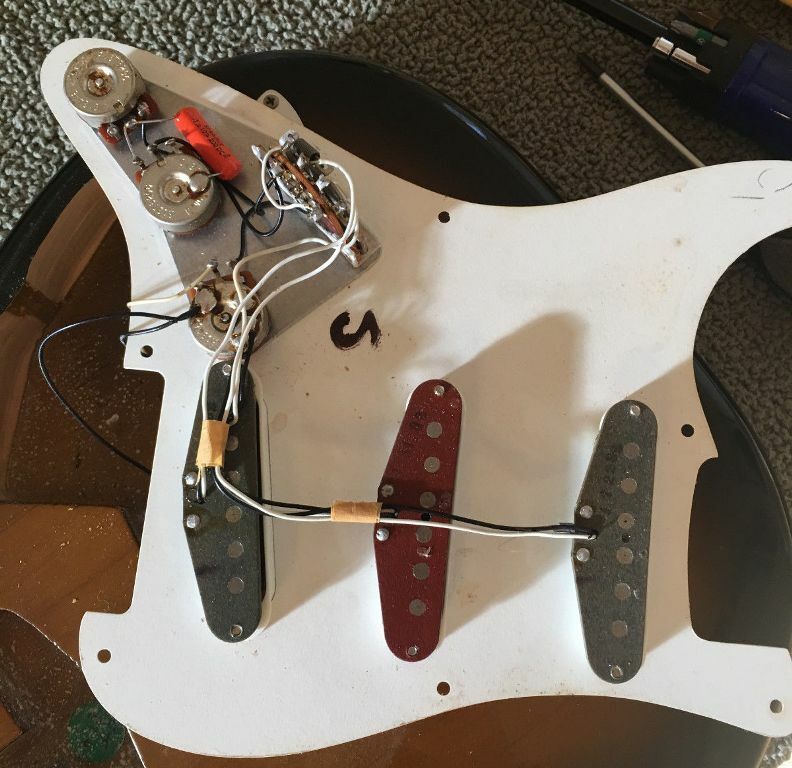 Controls to match pickguard see below except in 1976 white knobs on black guard 1 volume 2 tone 3 way switch to 1977 5 way thereafter. 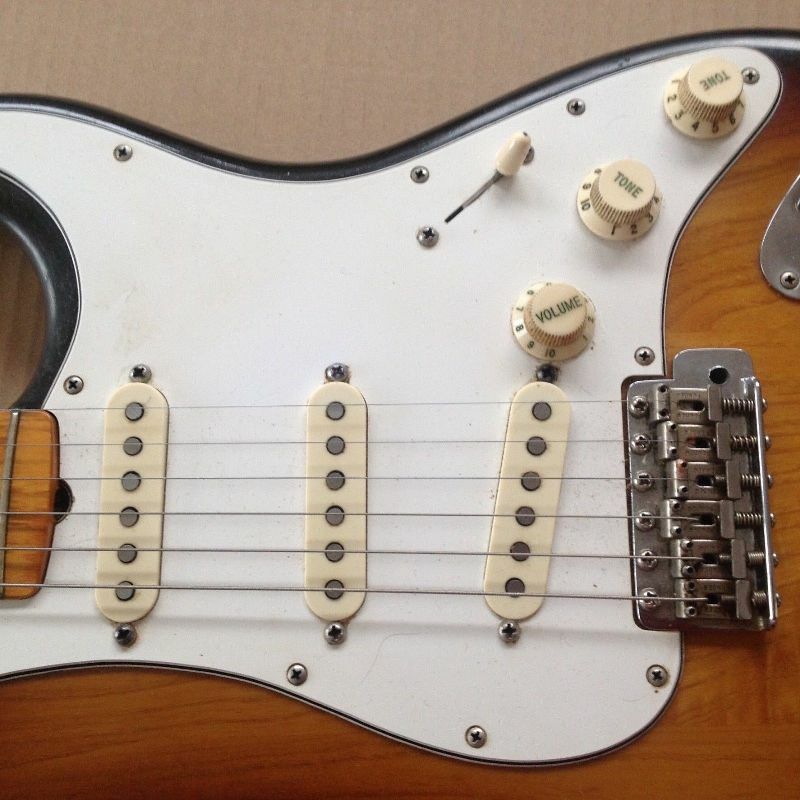 Cerb from the strat forum tells me he has a verified 1977 natural finish strat with flush polepiece pickups could be an inconsistency or maybe just using up parts. He doesn't think that the finish is Nitro or poly so I am trying to find out more. 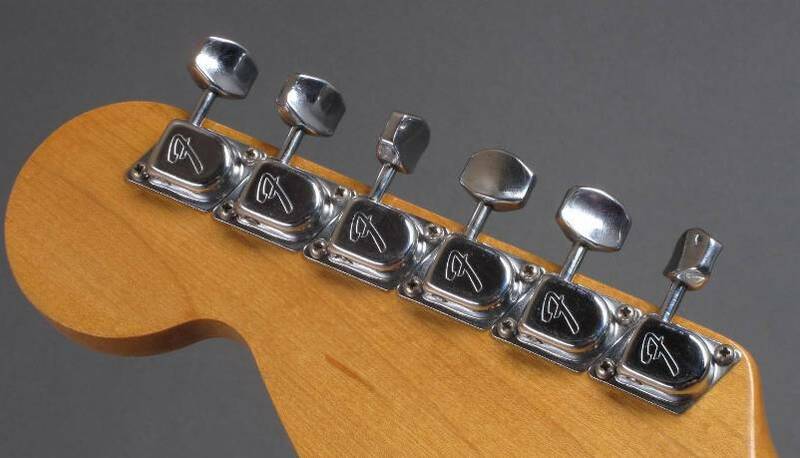 Rastus from the strat forum points out The Fender logo itself gained a thin gold outline around the black script, that was increased in size by the end of the 70s. 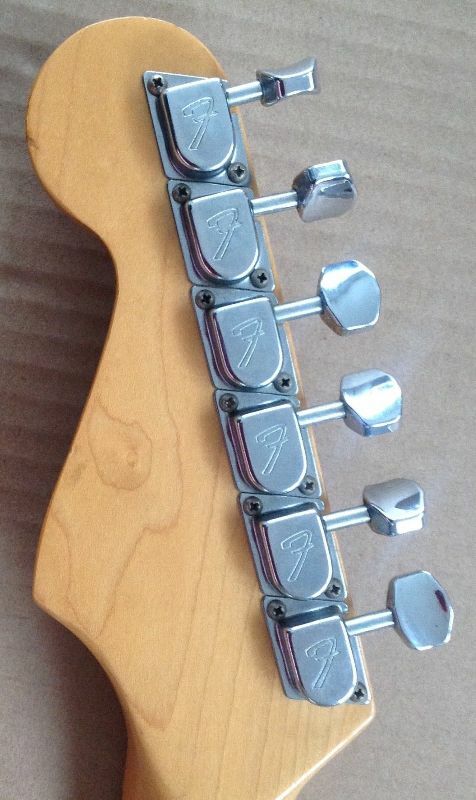 Designed by the Sculptor John Douglas in 1975 suggested by Arbiter the Fender UK distributor. This is the same specs except it has a bonded metal and fibreglass body. Relief floral and leaf scroll design inset with Rhinestones. Very rare there are around 27 in existence. Not really a special edition specs just as the Standard the only difference is the Antigua colour loved by some hated by others. Again the same as the standard except Fretted Maple 4 bolt neck, truss rod adjustment at body commemorative neckplate white or silver body with Anniversary written on in black. the white finish on the 25th Anniversary models was an experimental water-based finish that cracked and fell off, so they switched to the silver finish. Only a few hundred of the white ones were made, and I believe a few owners had theirs refinished to silver at the factory under warranty. 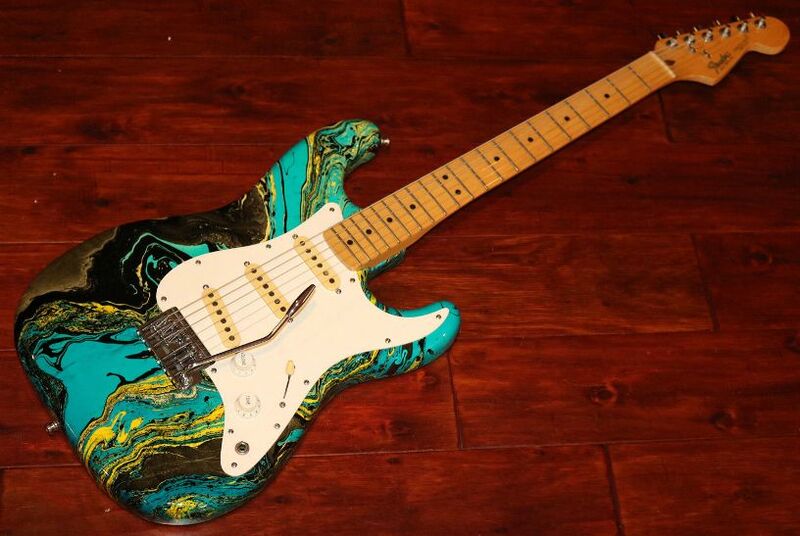 Launched in 1980 this guitar was completely different from the CBS models that went before. Anyone have a picture I could use? Walnut Strat Exactly the same specs as the strat except for the construction. All made of Black American Walnut with a Rosewood (some say Ebony anyone know for sure it looks like Rosewood ) or Maple board and still the same hardware, electronics and pickguard etc. 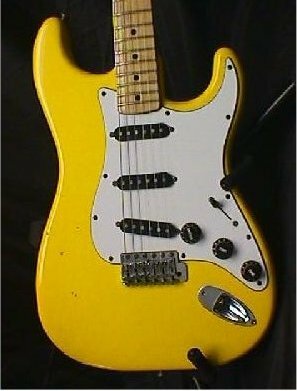 This is known as the Dan Smith Strat after one of the three Yamaha men that rescued Fender, the other two being Bill Schulz and John McLaren. I have seen a suggestion on the internet that some of these had bodies made of Hackberry wood I have no evidence either way anyone know? This is infamous 2 control model often incorrectly called the Dan Smith model. 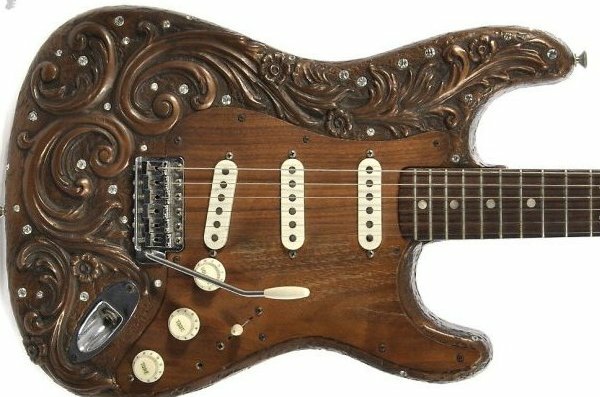 Not well thought of by a number of strat players, but I haven't tried one so don't know if this is just because people think that this layout isn't a proper strat or because it's a poor guitar. 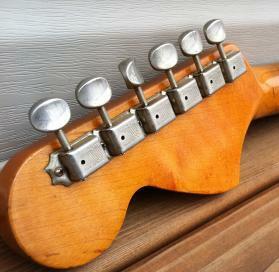 It was however along with the Elite the first strat to feature the biflex truss rod. Fender in their 1983 Catalogue advertise all the cost cutting as improvements. This is a guitar of legend and speculation. Information from reliable sources is sparse. Best guess is that around 25 of these were made including or plus 4 or 5 prototypes. 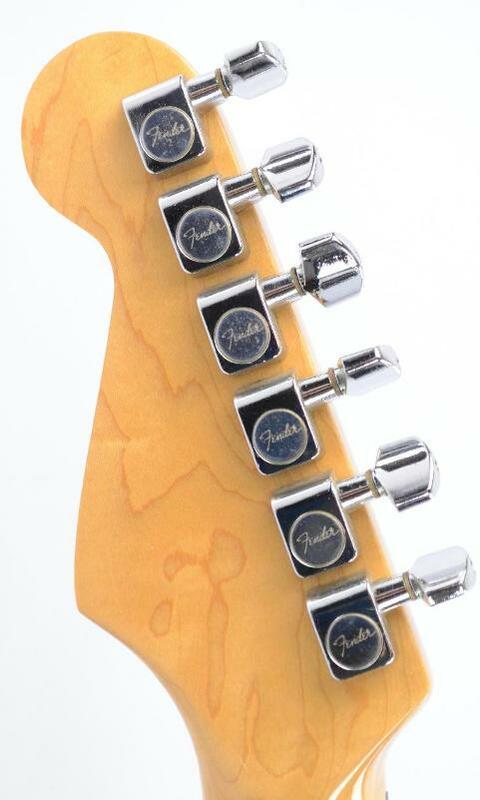 The prototypes have not for resale stamped on the back of the headstock. 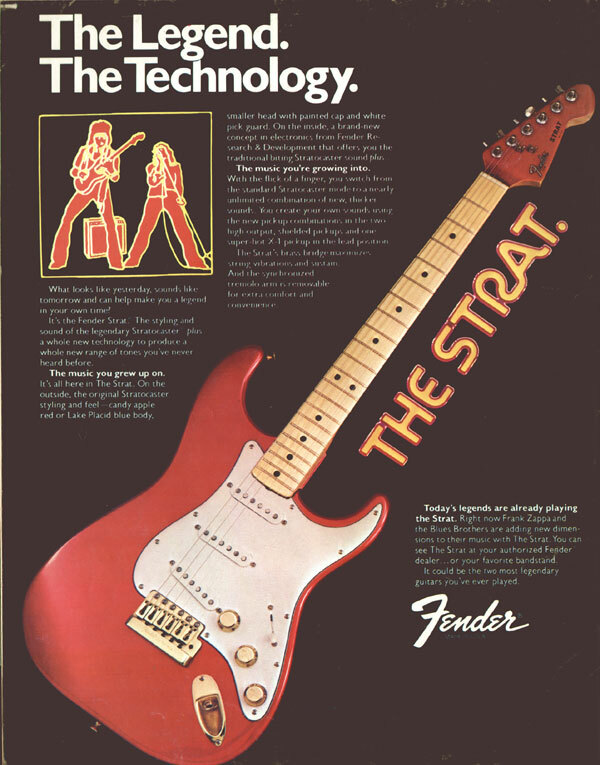 According to fenderreissue.com known examples of the prototype include one which belonged to SRV and one owned by John Mayer. Documented prototype serial numbers include, S972741, S972750, S972270 and S972257. I assume that because there are prototypes specs will vary slightly, here's what I know. 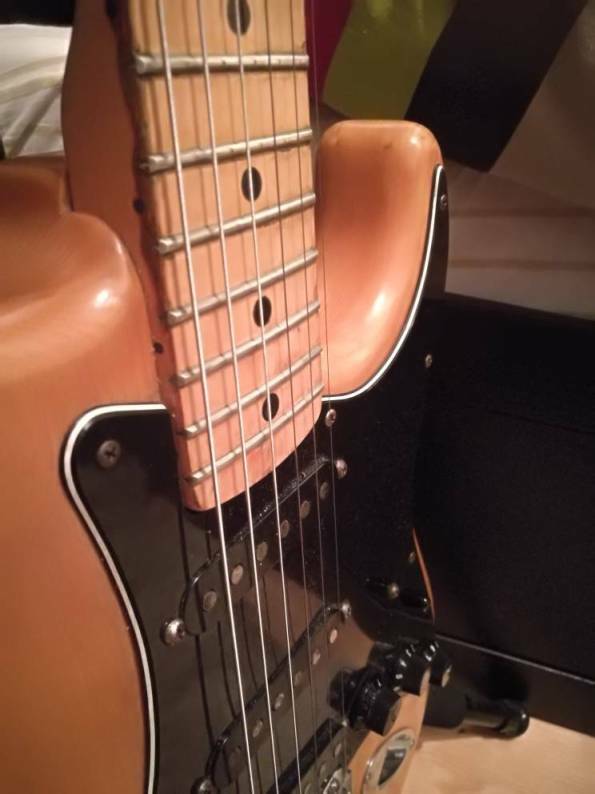 I have found some pictures on fenderreissue.com and am seeking permission to use them but have had no reply. This model was almost two years in development and boasted lots of new patents and ideas, launched mid 1983 and on sale for around 18 months. 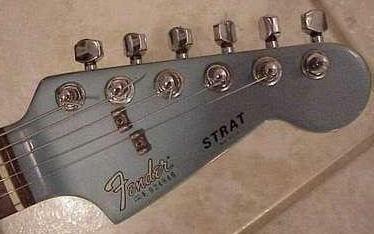 From the work that went into this I suspect it was expected to be the future of the stratocaster. 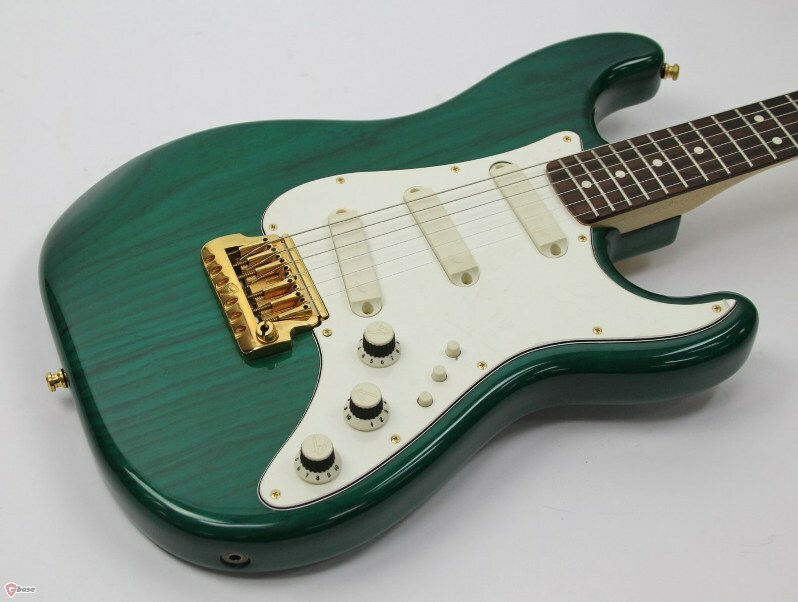 At extra cost you could have Candy Apple Red, Lake Placid Blue, Candy Apple Green, Aztec Gold, Transparent Emerald Green, Wild Cherry or one of the 3 stratoburst colours Black, Blue or Bronze. Same as the Gold Elite but constructed throughout of American Black Walnut with an Ebony board. 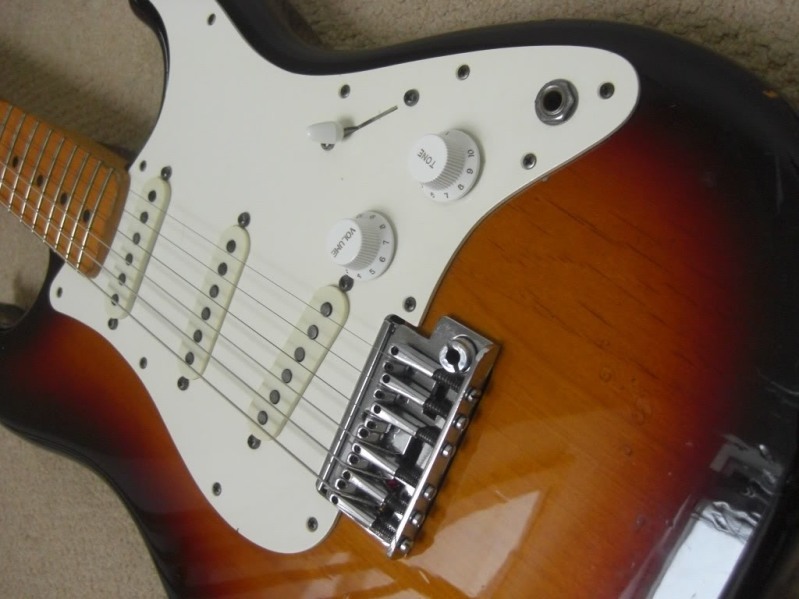 The variable quality and changes during the CBS years meant that people looked back fondly on the pre CBS years and wanted guitars from earlier days, so Fender decided to make them again. Various reissues were released towards the end of 1982 and appeared in the 1983 Catalogue. There were some details of these that were not vintage accurate, probably because of re-tooling costs, but they were well recieved and started the whole business of vintage reissues which is still carried on today. I doubt many would think that the 5 way switch wasn't an improvement on the three way so Fender solved this dilemma by fitting a three way switch but including a 5 way switch if owners wanted to fit it. These reissues are known as the Fullerton reissues or reissues having the Fullerton curves or Fullerton body. 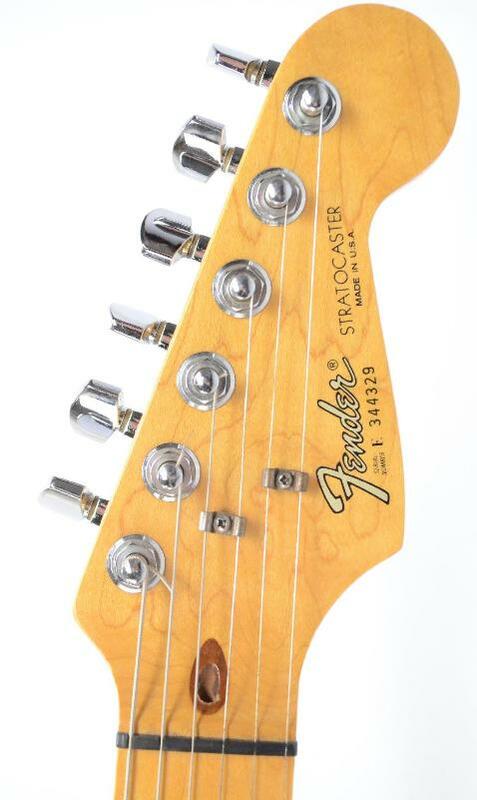 Fender uses the words "lovingly recreated" and "Faithful details on the 57 strat include" rather than say this is a copy of the stratocasters made in 1957. A 62 reissue and wiring a better picture of a 62 reissue would be nice.